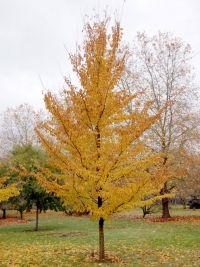 Elms were planted throughout the East and Mid-west last century for their graceful arching form and deep green foliage as well as their environmental tolerances. Since Dutch Elm Disease (DED) has caused their decline many new crosses have been developed using European and Asian species that resist DED as well as elm leaf beetle and phloem necrosis. We have grown 'New Horizon, 'Pioneer', Homestead', 'Prospector', 'Dynasty', 'Allee', 'Athena', 'Frontier', 'Accolade', 'Triumph', 'Princeton', 'New Harmony', and 'Valley Forge' over the past 15 years. We have narrowed our selections to those trees which performed the best in terms of disease resistence, form, and fall color. Our favorites are 'Accolade', 'Triumph', 'Emerald Sunshine', 'Prospector', and 'Princeton' at this point. These trees are a welcome addition to the urban and suburban tree pallette given their vigorous growth, toughness, and disease resistence. 'Accolade' 70'h x 60'w A Morton Arboretum selection with a graceful vase shape and form most similar to American Elm. Resistant to elm leaf beetle, DED, and phloem necrosis. 'Triumph' 55'h x 45'w A Morton Arboretum introduction with lustrous dark green foliage and a symmetrical growth habit. Resistant to DED and phloem necrosis. 'Emerald Sunshine' 35'h x 25'w Emerald Sunshine enjoys hot dry weather while casting cool green shade. 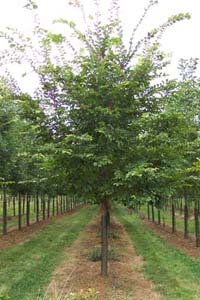 The medium size of this Elm makes it unique among larger cultivars. Good form with a well defined leader and well spaced upright arching branches make for a storm resistant structure. Rich yellow fall color completes the package. 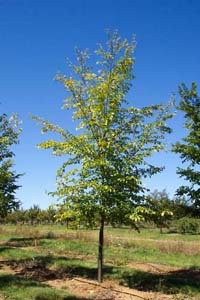 'Princeton' 65'h x 50'w Princeton Elm is an American Elm with dark green leathery leaves and mottled yellow fall color. 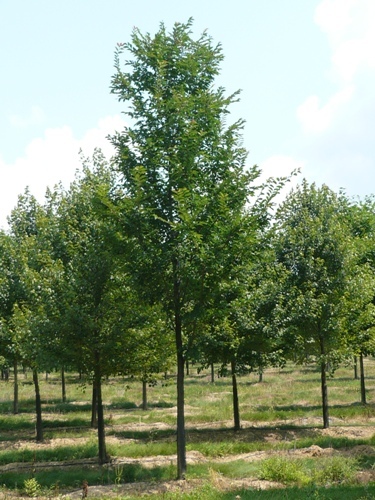 Of the American Elms in production it seems to be one of the best for form and disease resistance. 'Prospector' 40'h x 30'w Prospector has a low broad vase shape canopy and is a Wilsoniana cultivar. Resistant to elm leaf beetle and DED.